Ball State University in Muncie, Indiana, celebrates its centennial anniversary in 2018. Begun in 1918 as the Eastern Division of the Indiana State Normal School, Ball State remained a branch campus of Indiana State until 1929 when it became Ball State Teachers College, Indiana's fourth public institution of higher education. In 1965, the teachers college became Ball State University. Throughout its history, Ball State's distinguishing characteristic has been the positive interactions between students, faculty, and members of the community. 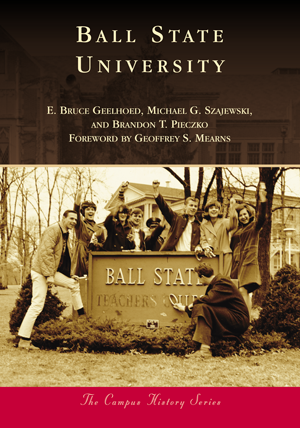 This book will show how these interactions have worked out at Ball State: in the classroom; on the athletic field; in social organizations, such as student government; fraternities, sororities, and clubs; and throughout the region. The book will also show how the members of the Ball family have played a major role in the growth and development of the university. Authors E. Bruce Geelhoed, professor of history; Michael G. Szajewski, assistant dean for digital scholarship and special collections; and Brandon T. Pieczko, digital archivist for manuscript collections, have used materials from a wide variety of sources to tell the history of a unique Midwestern university.